It was ridiculously naive of me to have discarded the beautiful Beet greens in the past.Well ,not any more,I've become very fond of this antioxidant rich wonder green.Isn't it strange earlier people ate exclusively the beet greens and not the roots.It's quite the opposite today,many know only the roots as the edible part. While talking to mom the other day ,She asked me "what's cooking? ".I said "Beet greens in dal" and asked her "Ammi does the subzi-wala(Vegetable Vendor) at your place sell beets with or without leaves on?" I was surprised to hear the answer as NO.Listen up subzi walas and others who carelessly throw away the beet greens in trash,you need some enlightenment about these Beet greens.Its next only to spinach,kale and chard in its nutritional value.No fair beet greens don't get just as much promotion as spinach.Beet greens can be used in cooking just as any of your favorite green.It can be sauteed or pureed ,to make a healthy addition to a meal. Thanks to sweta of Bonne Nutrition,I borrowed her brilliant idea of using the beet greens in my everyday sambar.Sambar is the South Indian spicy lentil soup that goes great with rice.The beet greens should be just as good in any kind of lentil\vegetable stew\soup.Beet Greens Sambar is part of my Beet full meal ideas series.Pleased to be sending this over to Weekend Herb Blogging,hosted this week by Ivy of Kopiaste ...to greek hospitality. Wash and Soak lentil for 10minutes. Wash and soak the lentil for 5-10 minutes. Drain the water,transfer in a pressure cooker or small saucepan with lid.Add 1 cups of water ,season with salt,1/4 tsp each of turmeric and chilli powder.Add the greens, cover and let cook on medium-high heat for about 10-12 minutes in pressure cooker and 45-50 minutes in the saucepan until soft.When cooked mash or blend it to smooth paste. Heat oil in a saucepan on medium high .Slice the onion and saute for a minute along with cumin seeds, mustard seeds and curry leaves. Add minced ginger and garlic saute for another minute before adding rest of the spices ,vegetables and tamarind juice. Simmer till vegetables are tender,about 15 minutes, then mix in the cooked mashed lentils. Simmer for another 5 minutes.Serve warm with rice. Unfortunately beets are not for people with kidney or gall bladder problems because of the concentration of oxalates in beets. i dont know abt this beet green yasmeen..thanks for the info..now i will check for this in grocery shops...sambhar looks yummy!! Even the plain stir fry with beet greens are delicous! 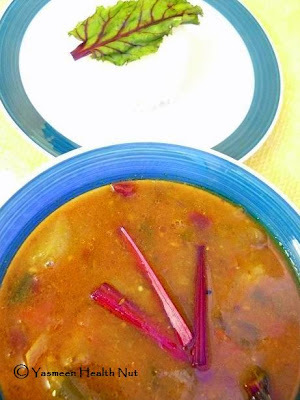 Delicious sambar! Never thought we can make beetroot kerai sambhar,I do with ordinary keerai,sure if I get I will try ! thanks for the info..very enlightening post..
nice photos, n good recipe......i mostly use them in rajma n other north indian curries.......i started using them ever since i started growing my own beets....subziwalas here throw away the leaves..
Wow! thats really a g8 idea. Will try ur version soon. lovely click. Healthy yasmeen..I know you are greens buddy..howabout health ? I came to know about these only when I came there.In India these are very rare.The leves are super healthy and nice of using these in a sambar.Comforting and healthy sambar. Never tried a sambar with this beet greens . I mix it with beets while frying. Thats it:) Nice info. Much useful for me. Thanks. When I buy beets, I always try to get them with leaves attached, because they're fresher. Sometimes I use the small leaves in a salad, and only once I tried cooking some of the larger leaves. You are right, they are a very healthful food, and I should get more serious about them. Thanks for reminding me. Beet greens are very nutritious..but dont know why they throw away the greens..I have not made sambar, but I make curry out of it..Tastes like any other greens..Sambar looks yummy..Will try next time. Thats a nice recipe. I always throw away my beet greens because I don't know what to do with them. I use them here...either in curry or raitha. But never saw beet greens in India. Sad trashing such a nutritional greens! 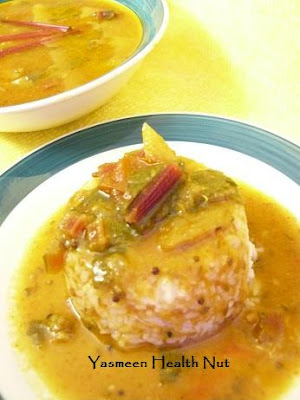 Sambar looks so nice, feel like jumping right into it. I love beet greens but the only problem here in Greece is that they sell them with the roots so I always buy them together. At the beginning I also used to through them away. Thanks for all the information given and I shall try and use them more now in cooked meals. The sambar sounds delicious. 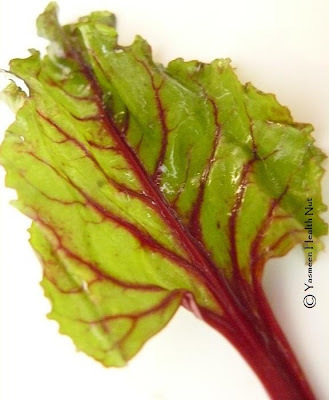 we use beet greens all the time , 'cos they are closely related to swiss chard. yasmeen, have you tried cauliflower leaves? they are nutrient rich and wonderful tasting too. in india, the veggie vendors give away cauliflower leaves for free if you ask them. we're growing cauliiflowers this year just for the leaves. I'm excited to see this recipe! 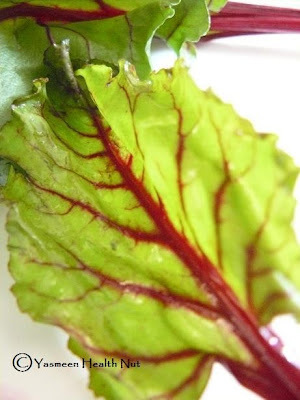 In a few months, we will be swimming in beet greens galore and I always like recipes to use them in. I have always just sauteed them in olive oil and then finished with some balsalmic vinegar. It is really good, but it's good to have options when there are a lot of beet greens to go through! I use these greens in sambar too! So healthy and yummy! Looks gorgeous and mouth-watering Yasmeen! Havent tried beet greedns. Looks healthy.. 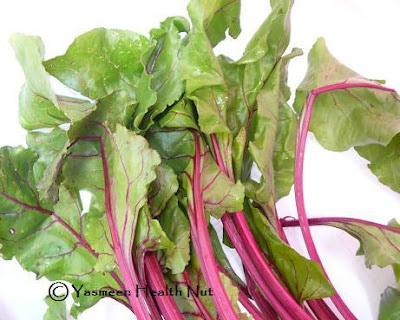 I didn't know abt the benefits of beet greens till about a year ago, but I love them now! Thks for giving me a new recipe to use them in, Yasmeen. Sounds like a very delicious dish! I've been eating more greens lately, and I was excited to see perfect, fresh, intact greens on the beets I bought at the farmers' market last weekend. I roasted the beets, boiled the greens, and served all with an orange vinaigrette. Your greens sambar looks delicious!